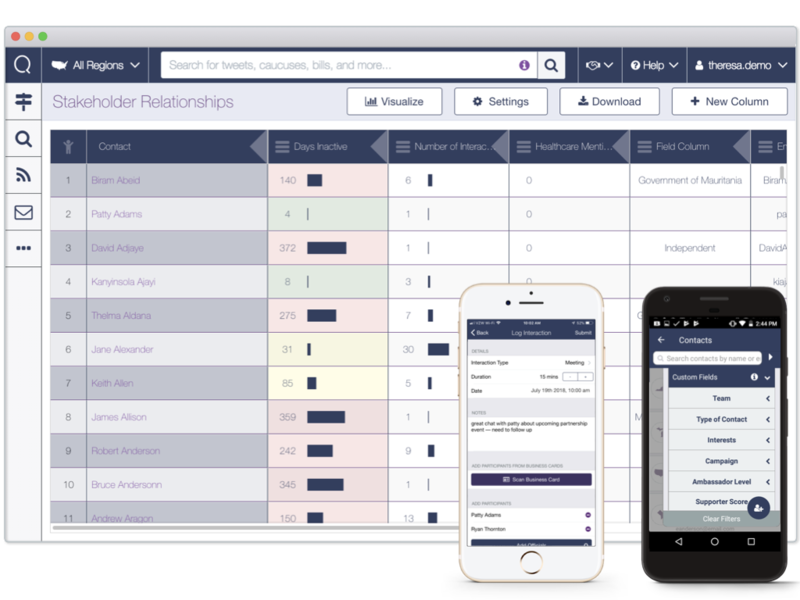 Quorum is the only fully integrated public affairs software platform. Track congressional bills and monitor social media, House Dear Colleague letters, press releases, floor statements, and more. 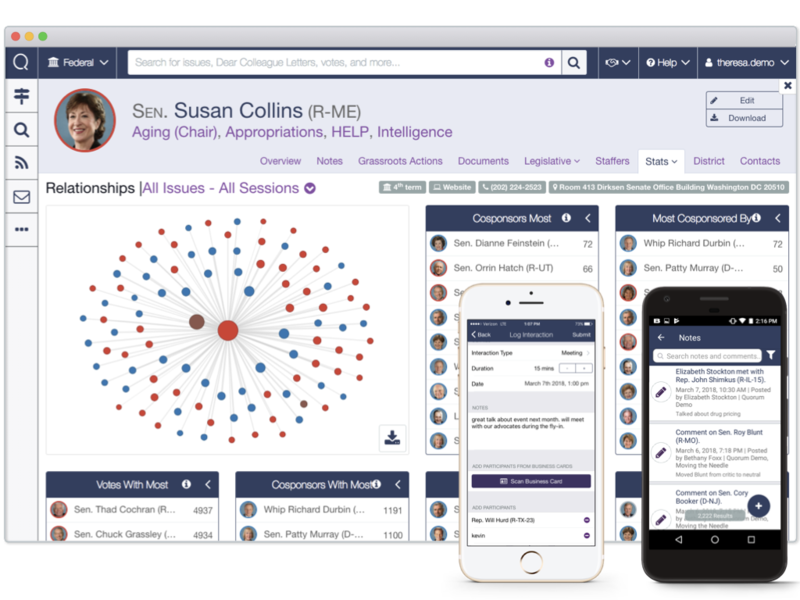 Quorum’s comprehensive congressional staff directory and email tool make it easy to quickly deliver personalized messages to hundreds of staffers at once. Use Quorum’s mobile app to track your meetings with each office. Set up email alerts and neatly organized projects for bills, social media, press releases, and more. 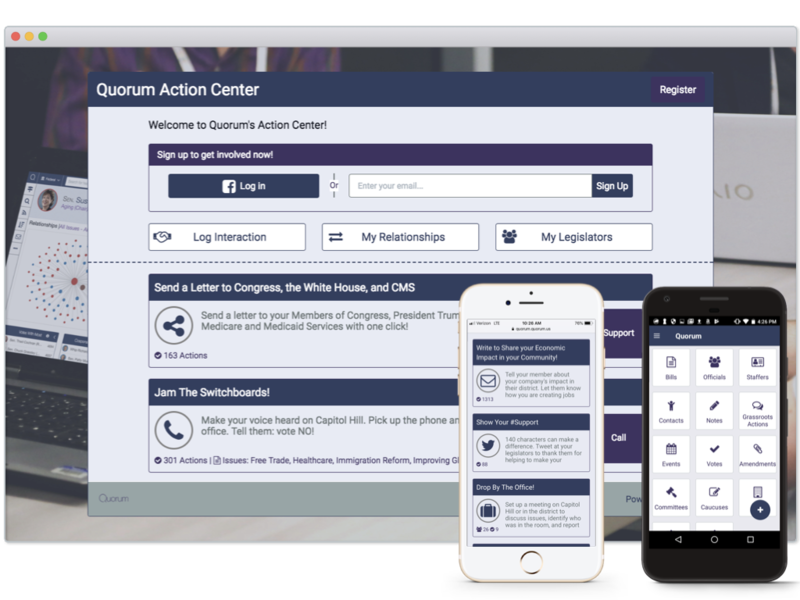 Quickly deliver personalized emails to hundreds of legislators at once and access information about bills and legislators on-the-go with Quorum’s mobile app. Keep an ear to the ground with Quorum Local. Never miss a mention when a local official is talking about your issue or organization on Facebook or Twitter. Search 50,000+ local officials to access contact information for relevant mayors, city council members, and county officials to know who to work with in thousands of cities across the country. 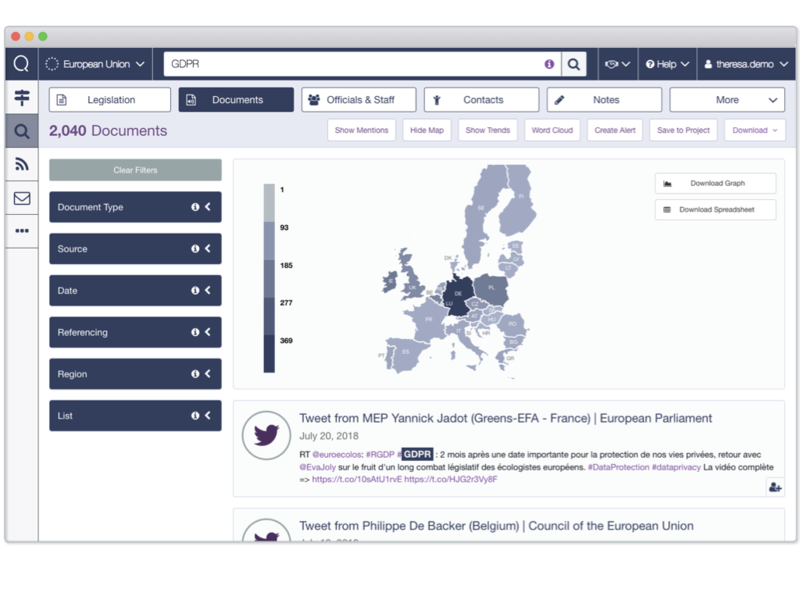 Follow the activities of the European Parliament, Commission, and Council with Quorum EU. Set up email alerts to ensure you never miss a mention of your issue or organisation by EU officials across legislation, press releases, social media, and more. Lower the barrier for advocates to take action with simple registration and combined campaigns that send multiple unique actions, all with one click. An integrated contact management system, email tool, and action center empower you to more easily manage your advocacy program. Quorum provides teams with a one-stop shop to monitor, communicate, and engage with their third-party stakeholders. Manage your contacts in a centralized database and send them updates on the work your organization is doing with an integrated email tool. At Quorum, we have built additional features that help clients accomplish specific objectives that can be added on to our products above. Monitor what your stakeholders are saying on social media, and create email alerts to notify you the moment they mention issues you care about. 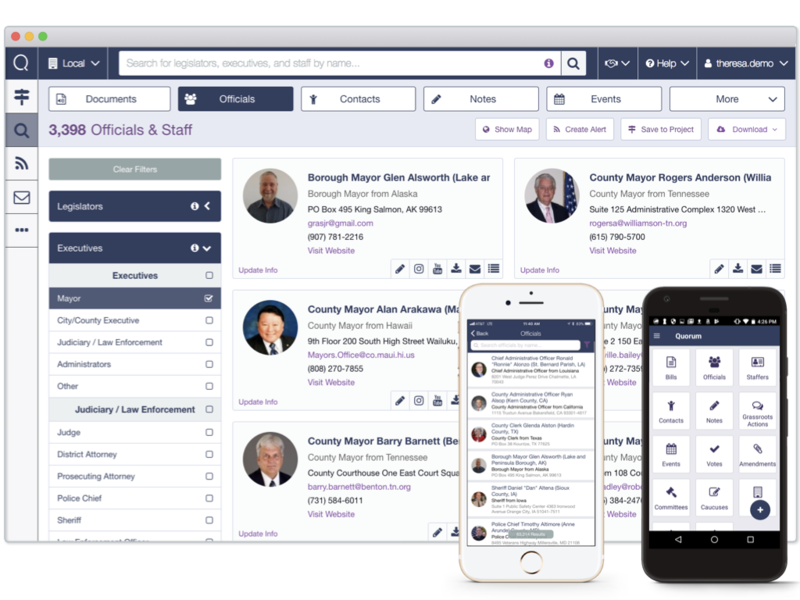 Build an institutional knowledge base from every interaction your key contacts have with elected officials by capturing that information seamlessly. Find out about pre-existing relationships that your key contacts have with elected officials by surveying members, advocates, or employees. Elected officials consistently ask how a particular issue impacts their district. 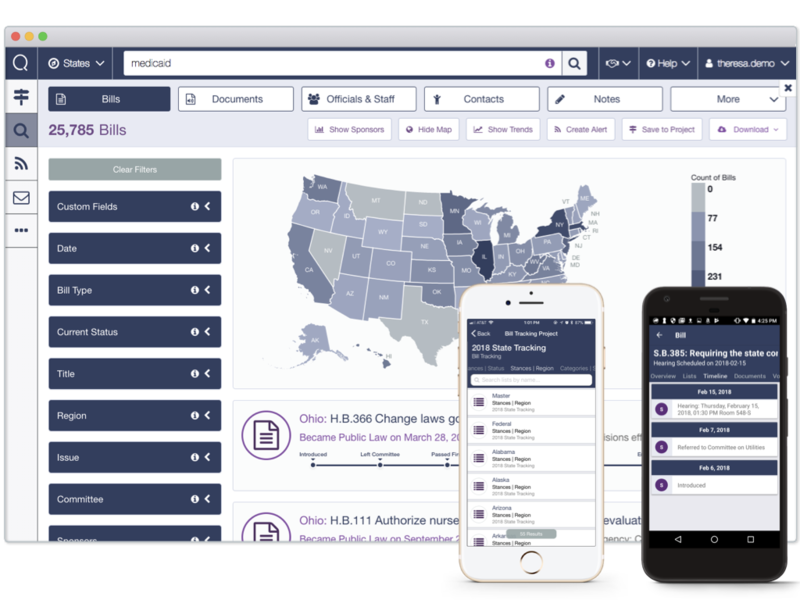 Format your organization's data across federal and state legislative districts and create powerful leave-behinds that communicate the story behind your data. We have clients push information to and from Quorum from CRMs like Salesforce, HR systems like Workday, association management systems like iMIS, Blackbaud, and Personify, and much more. We help clients centralize their data in one place so they can do their work more easily.